Petrol heads up and down the country are left mortified after seeing videos online showing supercars, such as a Ferrari, being crushed after its owner was caught driving it with no insurance but thanks to a new police-backed scheme that was launched in 2009, less and less are being sent to the big scrapyard in the sky – what a relief! Since it’s launch almost 10 years ago, over £500m worth of uninsured cars including Ferraris and Lamborghinis have been saved from the crushers. The scheme is known as CrushWatch and was launched in 2009, the aim of which is to save cars that have been driven by uninsured drivers from being sent to the crusher and so far it’s come to the aid of a number of high-value supercars. 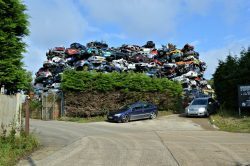 New scheme saves over £500million of uninsured cars from being crushed. © Copyright John M and licensed for reuse under this Creative Commons Licence. Thanks to the scheme, in 2017 a total of nine Lamborghinis were saved from the crushing machine. As well as Ferraris and Lamborghinis, a number of other high-value cars have been saved from the crusher over the past 10 years thanks to the scheme including Aston Martins and Bentleys, which were also awaiting their demise because their driver was caught on the road with no insurance. The scheme is run by HPI, who claim that CrushWatch have saved £544million worth of cars from being crushed after they were seized by the police because the driver was uninsured. UK forces have had the power to check up on illegally-driven cars since 2008 by using HPI, allowing them to decide whether to dispose of the vehicle or if it should be returned to the finance company, of which thousands so far have been. The scheme is now being used by the police more than ever before – the number of checks on motorists have risen almost five-fold since it was launched and it looks as though the value of cars being reclaimed is rising also. During the first year of CrushWatch, the average value of cars saved was £5,589, whereas in 2018 this value in comparison now stands at £9,052. The reason for this could be because more supercars are found to be on finance and sent back to the lender. In 2017, the overall total saved was a substantial £94million. It might be the high-value supercars pushing up the overall value of all vehicles saved by the scheme but it’s the more mainstream models such as the Ford Focus, Ford Fiesta, Vauxhall Astra/Corsa and Volkswagen Golf that make up the biggest bulk of cars recovered, alongside a good number of Audis, BMWs and Mercedes.